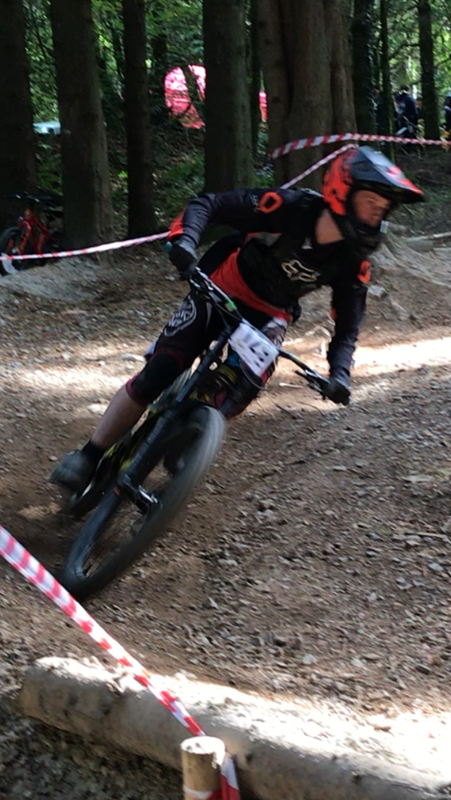 Taw Velo rider Tyler Pollington, from Braunton, North Devon, took part in the weekend racing, run by Woodland Racers at the Gawton Gravity Hub in Tavistock. During the course of the day, 150 riders from the Elite UCI competitors to the 10 year old rippers competed on the downhill course. Due to the high number of riders taking part and the spread of ability, made for spectacular racing. The course snaked its way down the hillside, taking in a number of gap jumps, twisting berms and steep technical sections, which would test all riders skills and abilities. Tyler in his first run, placed himself within the top five riders in his category. To increase his chances of a podium position, Tyler knew he had to make the second run count. Tyler knew that on his second run, he would need to use the knowledge he gained from his first run to his advantage. Tyler knew exactly where time could be made and lost, so pushed himself harder. His determination paid off and he was able to shave 2 seconds of his time, moving himself up in second place. Tyler will be competing in more events during the next few months and will be looking to improve his position. Newer PostHard Course for North Devon Riders.